We obtained your name and email address from ISI Thomson Scientific, 3501 Market street, Philadelphia, PA 19104 USA. If you wish to be removed from the ISI Thomson Scientific mailing lists, please click here ISI Thomson Scientific. Copyright © 2012 Elsevier B.V. http://www.elsevier.com. registered office: Radarweg 29, 1043 NX Amsterdam, The Netherlands, under number 33156677, VAT number 002967455B65. All rights reserved. 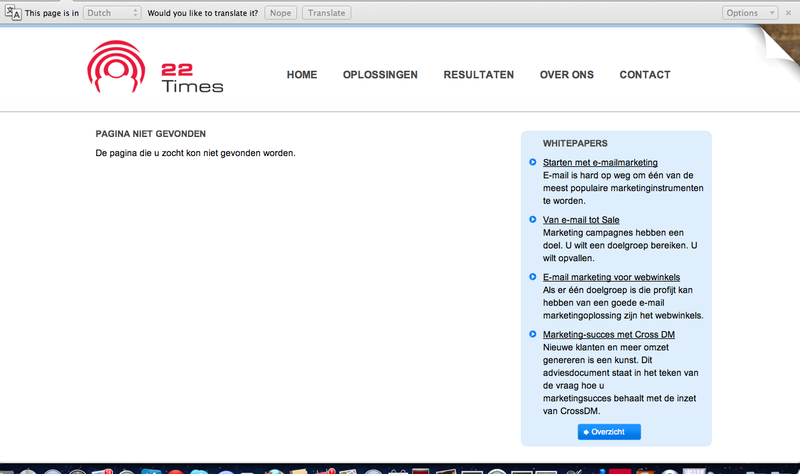 I can guess what it says but fortunately for those like me that don’t read Dutch, Google offers to translate. So I clicked on that offer just to be sure: “Page not found.” Great policy. Maybe I am supposed to pay to access it? I note – I have not posted the actual original link in the email because it has what appears to be some tracking information embedded in it. This I guess is what one could call an empty promise of privacy? We may request users of this Site to provide personal information. The information collected directly from a user may include contact information such as the user’s name, e-mail address, and postal address. This Site automatically collects certain information from your web browser regarding your use of the Site. Examples of information collected automatically from all users include the Internet Protocol (“IP”) address used to connect your computer to the Internet; computer and connection information such as browser type and version, operating system, and platform; and full Uniform Resource Locator (“URL”) click stream data, including date and time, and content you viewed or searched for on the Site. This Site also collects information through the use of “cookies” or similar technologies. Cookies are anonymous, unique alphanumeric identifiers sent to your browser from a website’s computers and stored on your computer’s hard drive. The type of information collected as a result of a cookie being stored on your computer is specific to your computer. “Session” cookies collect information about your use of the Site (e.g., whether you are logged in) and to give you a more personalized browsing experience and help you navigate the Site more efficiently from page to page. These cookies are temporary and are deleted when you close your browser. “Persistent” cookies gather statistical information about repeat usage from your computer or workstation. In general, cookies do not contain personally identifiable information, but when you furnish your personal information through the Site, this information may be linked to the non-personally identifiable data stored in cookies sent to your browser from the Site. You can prevent your browser from accepting certain cookies, have the browser require your consent before a new cookie is placed in your browser, or block cookies altogether by accessing your browser’s privacy preferences menu. However, if you block cookies altogether, you may not be able to register, login to the Site, or make use of the full features and functionality of the Site. If this site offers an online content database or learning service (“Service”) and you access the Service through an institution-sponsored subscription, your personal information and certain usage data gathered through the Service, such as the number of items you downloaded, any non-subscribed items you accessed, and test scores, may be shared with your institution for the purposes of usage analysis, subscription management, course management, and testing and remediation. If your institution is a corporation or other business entity, additional usage data, such as the types of records you viewed and the number of searches you ran, also may be shared for the purposes of cost attribution and departmental budgeting. If you wish to receive alerts, newsletters, special offers or promotions from us, please indicate your preferences when you register or amend your preferences upon log in at any time. If you wish to cease receiving any of this information, amend your preferences either upon log in or by using the “opt-out” or unsubscribe option or other means provided within the communications you receive. We reserve the right to notify you of changes or updates to the Site whenever necessary. I too received one of these emails recently. My response was, “I am not a biologist. Please stop sending me spam.” I liked to imagine a human being reading it, though I realize that the chances of that were vanishingly small. I agree it can be annoying, but why not just delete it and move-on to something else? I have opted out of Elsevier emails hundred times. They don't care at all. This is the only company I know that behaves in such an unprofessional way. Most companies will add you again to their mailing lists after you opted out — often after a year or so. But Elsevier, they add you to new lists every 2 – 4 weeks it seems. Unbelievable. How can I go about blocking this email? I get a new one every day and the sender rotates so outlook lets them sneak by into my general inbox.